The sheepskin boots have become the crown jewel of the shoemaker's brands, but how much more can they grow? NEW YORK (Fortune) -- You see them tucked into jeans, donned with leggings, even paired with mini-skirts: the furry, oh-so-soft sheepskin pairs of UGG boots. Teens have idolized the footwear while guys have called the boots ugg-ly, but the brand is a force for shoe company Deckers Outdoor (DECK). Yet there's concern about how much more UGG can grow. During the second quarter, UGG product sales increased 23% to $74.4 million, well below the 67% jump in revenue that occurred during the first quarter of 2009. The company expects overall sales in the fourth quarter -- usually a very busy time for the shoemaker -- to decrease 4% because of a shift in sales to the third quarter to accommodate for early deliveries. The news caused analysts to downgrade the stock and share prices to dip. "In our view," wrote Thomas Weisel analyst Jim Duffy, "signs of maturing growth in the domestic wholesale UGG business heighten the risk profile for shares." Over the previous two years, Deckers shares have traded at a 17% premium to the apparel/footwear index and a 20% premium to the S&P 500 (SPX). Despite revised positions, Deckers still recorded a $41 million profit during the second quarter and the company raised its full-year revenue outlook, expecting sales to increase 9% over 2008's revenues of $689 million. Part of CEO Angel Martinez's plan to keep UGG sales strong involves turning the brand into more than just a winter luxury. 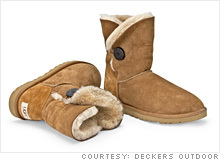 "UGG is simply not just sheepskin boots," Martinez says. "We're expanding the brand and evolving it to a broad-based appeal." The brand has introduced spring and summer lines that included sandals and beach cover-ups. Deckers is also expanding the men's line; while most women come to UGG for boots, most men seek the brand for its slippers. UGG, which Deckers acquired in 1995, has matured into the crown jewel of the company, outselling its Teva, Simple and other brands. Martinez says part of the demand for UGG comes down to the company's selective distribution strategy. "We really are careful about over-proliferating our brand," he says. Of course the fact that there's only so much of the prime twin-face sheepskin available to make some of the products helps, too. What's more, Deckers is willing to cut its losses. The Goleta, Calif.-based company put its eponymous line of loafers on hiatus in the 1990s for more than a decade and then decided to pull it. "The Teva brand took off and there just wasn't enough time or resources for Deckers," Martinez says. "We tested the concept of the brand coming back, but we didn't feel it was viable. We learned what we needed to learn and pulled away." Going forward, Deckers hopes worldwide growth will continue to thrive -- international sales increased 37% to $46.5 million during the second quarter this year. And despite some concern of UGG-mania slowing down, Martinez says there's a new must-have model for the fall. "The Bailey button," he says. "They're going to fly off the shelf."